Hi! What label?? "Made In Germany" in run-outs?? Please write about it a bit more description. I have a copy, not gatefold, on NOVA (6) MFD by Enjoy Rock Culture Ltd. G.I.O. 0577. printed in West Germany. Spine & label say ML-001, and labels say 'Music Life'. Asian price sticker is on the NOVA outer poly jacket. Anyone has heard about those 2012 Lp copies ? Would be cool to read something about it and the other TD reissues. Thanks. Virgin ‎– PZ 34427 Why is this not listed as gatefold [gat]? Mine is and the pictures seem to indicate this one is, too. I have a similar version to this. The album info. on the labels are printed higher up with the serial number just below the Dragon logo. Does anyone else have this pressing? I'm wondering if it's just a bad pressing or if I got hosed on this purchase. This is a repress from Virgin International. The amount of surface noise is ridiculous, plus, this pressing is super quiet! I have to crank it way up just to hear it...which just makes the surface noise louder, lol. Tangerine Dream is amazing but they require near perfect pressings to be experienced the way they're supposed to be heard, imo. Then again it might just be my copy. A classic album from the masters of E/M. 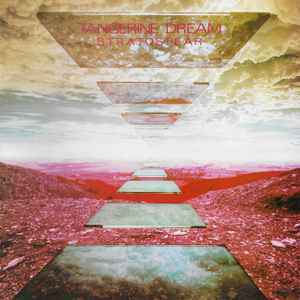 Tangerine Dream at the peak of greatness. Although Tangerine Dream's output (certainly 1970 - 2000) is a run of continually evolving albums, Stratosfear is a significant one from a stylistic perspective. After many years of largely improvised output, from psychedelic krautrock, through drone to pulsating synthscapes, Stratosfear is the first TD album to feature strongly composed melodies. The main theme in the title track, introduced near its start, is a surprisingly catchy melody, something the group would continue to work with over the next ten years. The album also sees the re-introduction of a wider array of instruments, including electronic percussion, piano, harpsichord, harmonica, and acoustic, electric & bass guitars, after several years of largely 'electronic' sounding music. Of course this isn't to say Stratosfear is a pop album by any standards, just that it stands out as strikingly different from the previous few albums. The band's trademark sequences are still evident in three of the four pieces, albeit playing a more minor role: there is less modulation, and the focus is generally on the melodies or improvisations that are layered on top of them. After the more ethereal sounds of Phaedra, Rubycon and Ricochet, Stratosfear very much lives up to the wordplay in its title, as it is probably the darkest sounding of the group's post-Ohr albums. Interestingly, TD recorded the soundtrack to the film Sorcerer at the same time, and the two records are strikingly similar in sound, both featuring menacing pulses and wandering mellotron-flute melodics. In widening the band's sound palette, Stratosfear is an important milestone for a band who continued to experiment; at the same time, its more streamlined construction has as much to do with progressive rock as it does ambient electronica, and the album sits at a crossroads heading towards a direction which lost the band some of their fans. As a standalone piece, however, it sits comfortably among the best of the group's Virgin Years recordings. ...after 20 years from this edition is maybe good made a new version:from the original masters tapes at 24 bit / 96khz ! a deluxe edition of this fantastic album!